Can anyone tell me specifically what all this says? If you have this on-hand, I'd try scanning it first, and barring that, cleaning it up in photoshop by raising the contrast and sharpening it a bit. Those big block kanji in the lower right are pretty indecipherable as it is right now. Good point, I can't scan it because it's the label inside my classical guitar, but I can definitely clean up and post a larger, clearer version later. 春日楽器製造株式会社 : Kasuga musical instrument production Co., Ltd. The red stamp is also the company's name. The long-standing mystery is finally solved (I've owned this guitar for about a decade, which doesn't say much for my curiosity). Thank you, Puella! Kasuga produced guitars of both original designs and designs based on classic American models. While the quality is medium to good it is generally the "reproduction" models that are found in the music stores. One reader wrote in to report that his Tele-style model plays "pretty good, and has a good feeling neck." In May of ’72, a portentous advertisement appeared in The Music Trades. In an ad stretching across the top of a two-page spread, drawn cartoon-fashion with a jet soaring from Japan to the United States, the headline read, “Kasuga Guitars Come To America.” Kasuga was a guitarmaker established in Nagoya, Japan, in the late ’60s. In ’67, Tommy Moore, the successful musical instrument merchandiser from Ft. Worth, Texas, and one of the founders of Hondo, visited Japan in order to strike up a guitarmaking deal. With only a voucher of credit in his pocket and no contacts, Moore hooked up with a Mr. Kaku, who steered him to Tokai Gakki. Tokai had become very successful in Japan making and marketing the Pianaca, a keyboard harmonica used in Japanese schools. On December 15, 1970, Moore and Tokai Gakki entered a joint venture called Tokai USA Inc., and Tokai began making private label and OEM guitars. Tokai quickly found it couldn’t keep up with demand, so it found a factory that could meet its quality standards: Kasuga. Another joint venture was established between Tokai USA and Kasuga called Kasuga International. Marketing offices were established in Singapore, Zurich, and Frankfurt. In ’72, these guitars began to come into America. In December, ’72, an ad touted the Kasuga line, copies of the most popular Gibson, Fender, and Martin acoustic and electric solidbody designs. Presumably these included Telecasters. 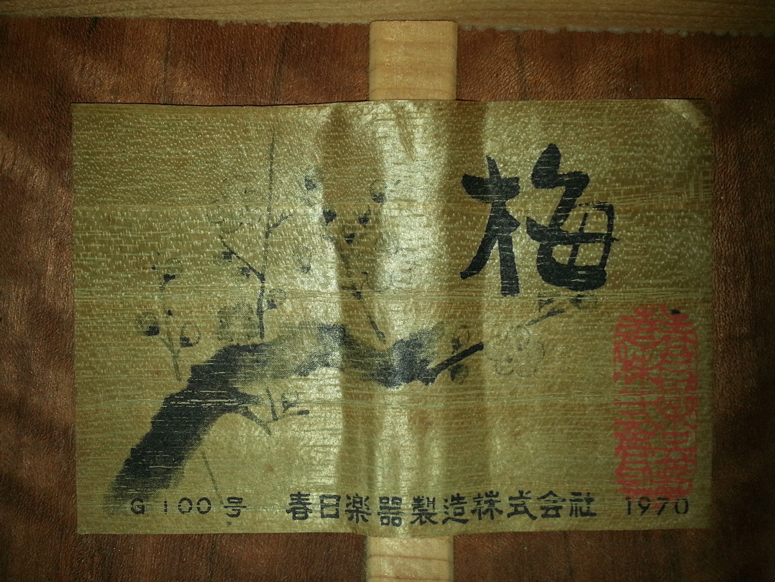 These were sold under the Kasuga name (briefly; a notice of Kasuga acoustics appeared in Guitar Player in September, ’72) and carrying the monikers of various importers, as in the ’60s. Kasuga was one of a small handful of Japanese guitar manufacturers that built guitars in it's own facility (Kasuga Gakki). Almost all the other brands of Japanese guitars from the now famous "copy era" were manufactured in one of three factories... Hoshino (Hoshino Gakki), Matsumoku or FujiGen (FujiGen Gakki). Matsumoku was originally a sewing machine factory that made copies of Singer sewing machines. When the copy era took off, approximately half of the factory was converted to a guitar making facility and they did so until the entire factory burned down in 1987. Looks like I got one of the good ones, I don't know about Martin quality, but it's always been a superior player to any medium quality instrument I've played. Probably helps that it is, I assume, one of the domestic models rather than one made for export. In any case, it's got one of the coolest labels I've seen on a classical. Thanks again, Puella. Isn't "Kasuga" engraved on your guitar?